You can control Instagram notifications on your iPhone in two different ways: through the Instagram app or through the Settings app of your iPhone as a whole. 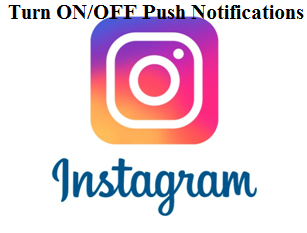 By turning on push notifications, you get notified immediately whenever any activity takes place on your Instagram feed which could be a new comment, like etc. Now let’s check way to get sound notification for Instagram on Apple iPhone. Instagram lets you capture and share pictures and videos with families, friends and followers world over publicly or privately in a simple way. It is a widely used internet based application used by over 500 million people. The app can be used on your mobile, tablet, laptop, computer etc. When you install Instagram on your iPhone for the first time, you are prompted to enable or disable push notifications. You can also make it on/off later if you want. Launch ‘Settings’ app from the home screen of your iPhone. Select ‘Notification Center’. Then select ‘Instagram’. A new screen will be displayed showing you option to turn it on/off. Turn it on. You can also choose how it will appear on your iPhone; the options given are: badge icon notifications, Instagram alerts, sound notification and notification being displayed on the iPhone lock screen. Tap the profile icon of; a dot with three lines displayed on the toolbar. Then select the cog icon. Options screen will be displayed. Tap on ‘Push Notification Settings’. Turn it ‘On’. Once you have turned the push notification on, you will get alert every time when someone comments or likes on your post.